Chicharrón is a dish usually made from fried pork rind, but in Latin América and Spain, there are other variations of chicharrón made from chicken, beef and fish. 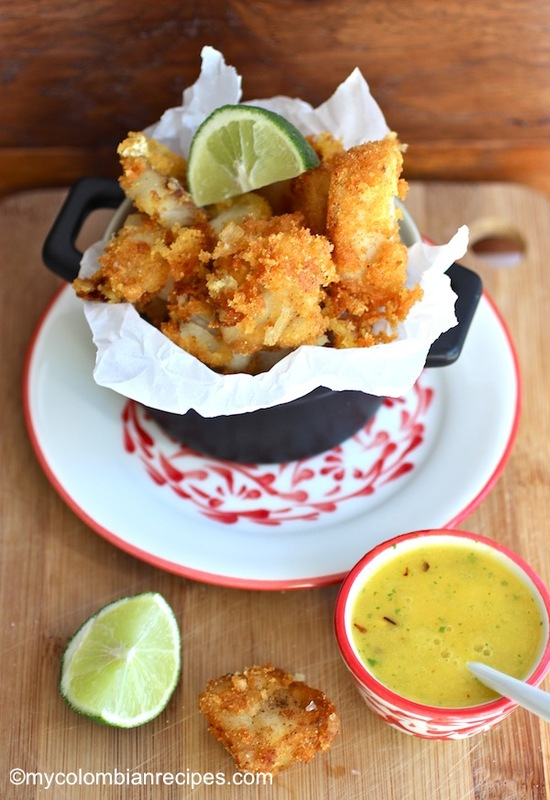 The most popular Chicharrón in Colombia is made with thick, fried strips of pork belly. It has a crunchy texture and is one of the indispensable components of bandeja paisa, the signature dish of Colombia. 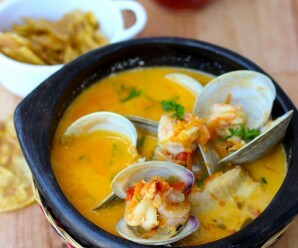 These Chicharrones de Pescado are a traditional dish from the department of Amazonas located in the south of Colombia. 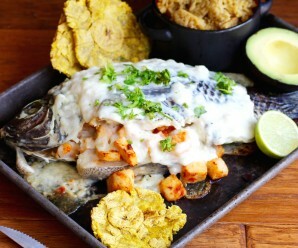 This dish is traditionally made with Pirarucú, a white fish from the Amazon and considered the largest freshwater fish of South America and one of the largest freshwater fish in the world. 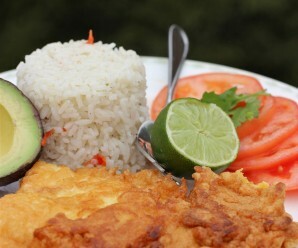 Chicharrón de Pescado is also a popular dish in Peru, where it is usually served with ají amarillo. This is a very simple dish, but delicious. The way to prepare it is by washing and drying the fish and cutting it into small pieces, which are seasoned with a mix of lime juice and salt. 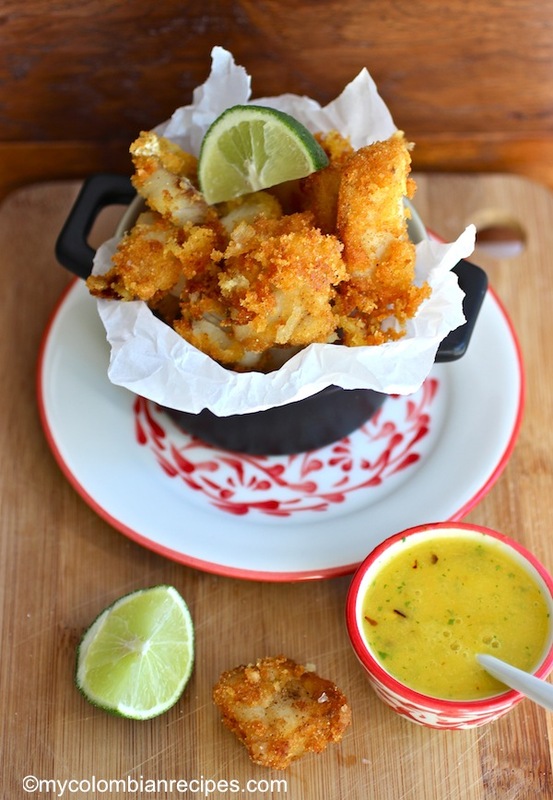 The batter is made from cassava flour, salt and pepper, then the pieces of fish are fried until crisp and golden. They are quite addictive, that sort of snack you just can’t stop eating. Season the fish pieces with salt, pepper and lime juice. Add the flour to cover the fish. Put in a plastic bag and shake. Fry in the hot oil for about 2 minutes on each side or until golden. 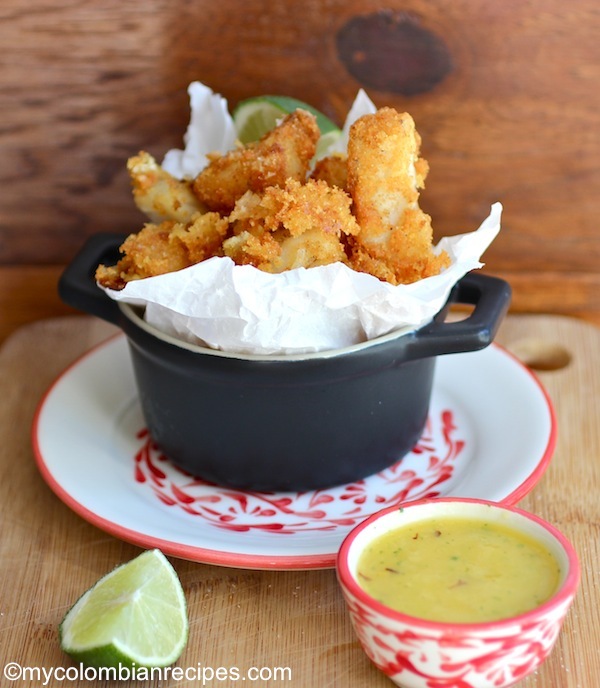 Place on a plate lined with paper towel and serve immediately with the mango spicy sauce or your favorite sauce. To make the sauce: Blend the pepper with the mango juice, olive oil and lime juice until everything is mixed. Season with salt and pepper. Use it immediately or have it on hand up to an hour in the fridge. Me gusta mucho chicharón de cerdo. ¿Qué tipo de carne hace el pirarucú? ¿Es escamosa como el bacalao o más fino como trucha o lenguado? En las fotos, se ve como grandes copos similares al bacalao. 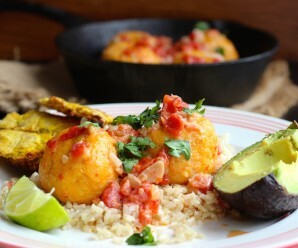 These fish fritters look so appetizing, Erica, and pair so well with sweet tangy mango sauce. As always, it is soulful and real. Love, love your recipes. the crust on this looks so crunchy and tasty! delightful concoction! 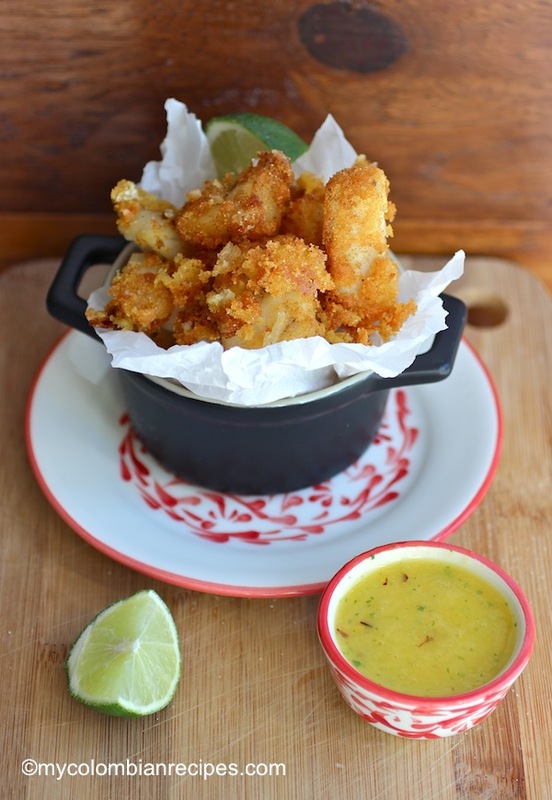 Not fond of the pork variety but loving this fish way of preparing chicharron! And the mango sauce is a perfect match. Hi Erika, Could you please tell me what kind of white fish do you recommend? Can I use almond flour? I don’t have cassava flour on hand.